BCI Port Authority In-A-Box Security Screening - Port Authority In-A-Box, Security Screening, Includes: Motorola MC75A Biometric Mobile Computer, Zebra RW420 Portable Printer, and IDSoftware Securegate Software. Port Authority In-a-Box, Security Screening targets ports throughout North America to improve security. 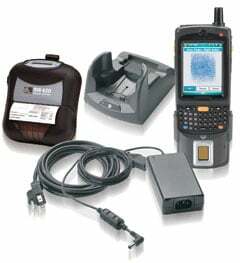 This mobile solution consists of a Motorola MC75 rugged handheld computer, MC75 biometric fingerprint reader, Zebra RW420 printer, and idSoftware"s SecureGate application. Using fingerprint, PIN, and image recognition, this solution is designed to securely and accurately allow or deny access to Sea Ports and Airports. With it you can manage the registration and supervision process with optical fingerprinting, identify individuals previously booked into a local, regional or state database, and verify visitor identity in seconds and confirm with a picture. The BCI IB-POR-SS-ACB is also known as IB-POR-SS-ACB	or IBPORSSACB	.